Former BYU basketball star Jimmer Fredette hasn’t given up on his dream of returning to the NBA. He’s also not averse to lining his pockets with more cash in the process. 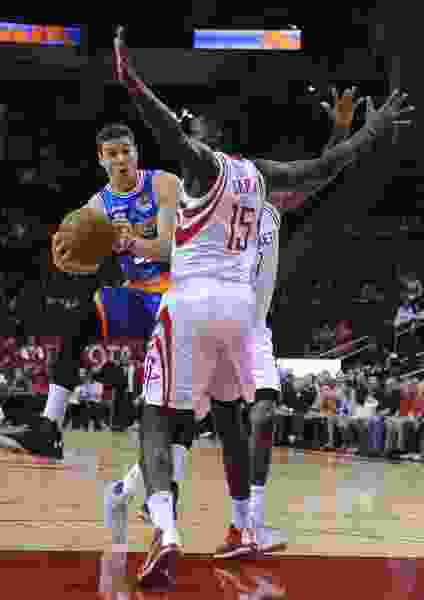 Hoping to catch the attention of an NBA club, the current star of the Shanghai Sharks of the Chinese Basketball Association is playing for the first time in The Basketball Tournament, a $2 million winner-take-all single-elimination event being held at various arenas throughout the United States this summer. The open-application, five-on-five TBT started with 72 teams and is in its fifth year. It has steadily grown from a $500,000 purse to a cool $2 million and an ESPN contract. It is open to anyone who’s not on a current NBA roster — former college and NBA stars, international players, NBA G League regulars and the like. That apparently includes Fredette, who makes more than $1 million a season in China but also has his own shoe contract and plenty of other endorsement deals in the country of more than 1.3 billion people. Fredette is living in Colorado this summer with his wife, Whitney, and daughter, 18-month-old Wesley. He has one more year left on his Sharks contract and plans on returning. He has been wildly successful playing overseas after five mostly disappointing seasons in the NBA with Sacramento, New Orleans, Chicago and New York. However, if the offer is right, Fredette says he will give the NBA another chance after being selected with the No. 10 pick in the 2011 draft. He averaged 6.0 points per game here. In China, he’s averaged closer to 38 points per game and been an all-star and an MVP candidate. Team Fredette also includes former BYU stars Brandon Davies and Charles Abouo. Fredette only coached the team last year, but it fell 100-97 to Team Utah on a last-second shot in the opening round. He’s lacing up the sneakers this time, though. Team Fredette will meet the winner of a play-in game between West Coast Ronin and the Peoria Allstars on Saturday at 10 a.m. MDT in Columbus, Ohio. The game will be televised by ESPN. Team Utah, mostly former Utes, lost 84-83 in late June to a team comprised of former Gonzaga players known as A Few Good Men in Spokane, Wash. However, the Gonzaga gang was eliminated 95-48 the next day by Gael Force, a team of former Saint Mary’s players. Still alive, Gael Force is in the West Regional. Team Fredette is in the Midwest Regional. Another local team, Utah Valor, lost 98-65 to the Fort Hood Wounded Warriors last Friday in Los Angeles. Team Fredette drew a No. 2 seed, but that was before Davies was added to the roster. Davies posted on his Twitter account that he would play if he gained 1,000 new followers on Twitter in a week. It happened in a few days. Fredette, Abouo and Davies starred on the 2010-11 BYU team that reached the NCAA’s Sweet 16. Of course, Davies was not allowed by BYU to play in the Cougars’ final two regular-season games, the MWC tournament or the NCAA Tournament because of an honor code violation. Like Fredette, he is flourishing overseas. Davies is playing in Lithuania and recently led Zagaris to the LKL championship and was named Finals MVP. “He had a phenomenal season over there,” Fredette said. Aside from the June games in which Team Utah was involved, the TBT began in earnest last weekend. It will conclude with the semifinals and finals in Baltimore Aug. 2-3. Fredette believes his team has a good chance of being there at the end. All of Fredette’s games are scheduled to be televised by ESPN or ESPN2.